THE BLEACHER BRIEFINGS: Were the 1990s the Last Sandlot Generation? 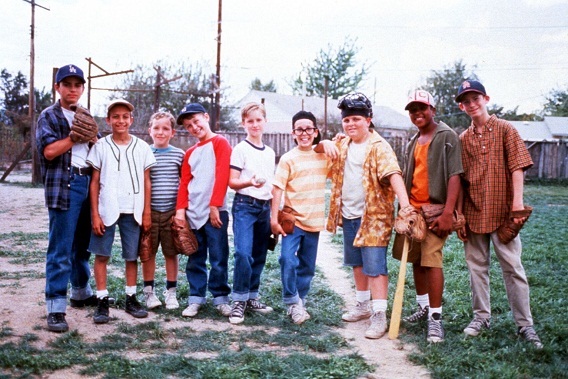 Were the 1990s the Last Sandlot Generation? The other day, I suggested to my 9-year-old nephew that he should watch The Sandlot, and he promptly replied with, "I hate that movie." Mind you, this came from a kid who plays travel league baseball. Immediately, I accused him of blasphemy, as The Sandlot possibly defined my childhood of playing outside with my friends and getting into stupid situations. This article isn't a review of the movie, but is meant to address a more important issue, which is -- children of today have officially decided playing outside is dreadful, and that they would much rather spend their free time inside playing video games. What made The Sandlot such a good movie for myself, was that what Smalls and company did during the movie were the events in my childhood that I'll never forget, such as camping in a tree house, making s'mores, playing sports, and checking out good looking girls. Even doing stupid things and trying to figure out ways to fix the problem before my parents got home. My nephew really made me think of this dilemma two years ago, when during the 4th of July he wanted to stay inside and play his Wii rather than play outside all day. Seriously? On the 4th of July? Stay inside? The scene from the movie where it's the 4th of July weekend and all the neighbors are outside enjoying each other's company with a big cookout and the boys head off to play ball really was right out of my childhood. That was the Christmas of the summer. But today, that doesn't exist anymore, at least in my opinion. Now, people hardly know their neighbors, let alone want to spend time with them. A lot of people can barely stand spending a day with their own families. For my nephew to say he hates The Sandlot confirmed to me that children of today really are different and just don't care as much about discovering life and maturing. I honestly believe that technology has eroded our social skills and made us an individualistic and selfish society. You can see it every day in a major city on the metros, when almost every single person 35 and younger has their headphones on and are wrapped up in their own world. I believe this issue also could tie to why children are becoming so overweight and lack social skills. The scary part is, as this generation ages -- they will only get lazier and become more isolated. Don't get me wrong, my nephew and his friends play organized sports, but they never do what the boys on The Sandlot did, which was hangout outside all summer from 8 am till 10 pm tapping their imaginations for things to do. Many might say I'm just being hypersensitive because everyone reminisces about their childhood, but I think this issue has legs to stand on. I also believe that since today's youth live in their own world and are constantly filled with new technology, they are inherently not concerned with respecting the past and finding joys in it. At an early age, I was listening to The Beach Boys and The Temptations. I was watching Sunset Blvd, Chips, and Citizen Kane. But today, unless directed by their parents -- children do nothing of the sort. If we lose appreciation for our past and our established values, I feel that we are in real danger of forgetting what made America one of the greatest countries in the world and a place every kid wished they grew up in. I feel bad for today's children, because I believe that as a child of the late 80s and 90s, I was among the last of The Sandlot generation. Can this be fixed? Yes, in small segments by parents who mandate it. But will it ever be like it used to be? No. Which is truly sad. The scary part for me is the thought that someday, the next generation will be our Armed Forces. What happens if the majority are overweight and don't even have the skills to go camping? Great read. And Squints ruled. I would argue it might even be a decade or 2 earlier. I'm thinkin the 80s myself.